the Road to 24 Hour Comic Book Day – part 8 – It’s over! Well, I am back! 24 Hour Comic Book Day was a fantastic success…even though I did not finish! (more on that later) The event went fantastic thanks in part to our organizer Doc Popular and our host Gary Buechler at Comic Outpost and his staff (Harry and The Ray). So, while the event is still fresh in my mind I wanted to jot down some notes on my experience and what I learned. I will be posting the comic on-line once I get it scanned and prepped. It’s the morning of October 18, 2008 I took the MUNI K line and arrived at Comic Outpost at about 9:45ish running into Mke Hales and Doc Pop. The store was not open yet so we walked down Ocean Ave to find some refreshment (a 7-11 store). 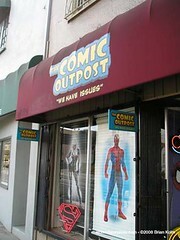 We returned to Comic Outpost and we started to set-up. Doc recorded a little intro for the folks at home and then Gary spoke to the group to get us started. If Doc does the feed next year it would be nice to have a series of announced times for reports to be given so that folks who don’t’ want to watch the whole time. The artist participating worked in pretty much any style imaginable with one person working 100% digital on a Wacom graphic tablet screen to plain old paper and pencil. Everyone one works a bit different with some of us planning what we were going to do in some form first to those who just jumped in and started drawing. Doc Pop got ideas for his comic from his Twitter feed on his iPhone. In one case two ladies collaborated together on doing their comic. – I knew that I wanted to have Japanese Superheroes as part of my story as well as making it more film noir than I had in the past. I also had an postcard of a Mexican painting with a stone idol holding a beautiful girl that inspired me to have two characters of a gal and her boy friend who was a statue that did not move through the first half of the comic. – I was going to teach a cartooning class at the Cartoon Art Museum from 1 pm to 3 pm so I knew I needed an idea of where I was going so I could draw a bit on the MUNI ride there. I did thumbnails of all the blank pages and started filling in the first 12 of them. I would later stop this process to save time. I figured the story was about a space pilot that lands on a remote island after being shot down. He finds a beautiful girl who seems to think a stone statue is her boyfriend. Other space pilots arrive and….well…that is as far as I got at this point. – For me I worked on 8.5″ x 11″ card stock that I purchased at Kelly Paper and that I had printed a comic template on for the challenge. I also had cut some black paper that I could mount on the templates so as not to have to color a whole page black. I had drawn the outside box in blue on the template sheets the day before the event to save myself some time. – I used a light blue Color-Erase pencil to rough out the pages on the template and started drawing blank mannequins to get the story worked out. A template page being roughed out in blue pencil. – I started with the first page which would use a sheet of black paper to give it more of a dark mood, which I mounted onto the template paper. I used the black Artagain paper from Strathmore and found my light blue pencil showed just fine while drawing on it. – After roughing out two or three more pages, I headed off to the Cartoon Art Museum at 12 noon with my thumbnail images and some blank templates and a ruler. I tried to draw on the Muni K line and found it hard to do unless you have a place to sit. The class went well and I use it as a chance to design my evil alien race. Afterward I headed back to Comic Outpost with a ride from fellow teacher and artist Toni Nobel. I arrived back at the store (about 3:45 PM) to find everyone drawing and/or eating lunch that was provided from one of the events sponsors, a local Mexican restaurant. Folks were progressing a different speeds with some churning out work at a steady pace and others that where taking some more time to figure out where their stories would go. -Â I started plugging away on my penciled pages to get as much done as possible by the half way point at 11 PM. I found that I edited the story as I went along and even removed a character that would just complicate things. – I was going to continue using thumbnails, but found that once my story was flowing I just…well…went with the flow. I did jump forward about half way through the penciling stage to draw the last page so I had something to work towards. The 24 Hour comic I did in 2005 had “to be continued” and I wanted this years comic to a complete story. It’s good to know where your going with your comic, so that when you are more tired at..lets say…4am you don’t need to think very hard. – I decided early on that I would either do the word balloons last or not do them at all. My spelling is terrible without the aid of a word processor and I was more interested on working on the art. The challenge is to have a complete comic including dialog, but I was OK with it if I did not. A radio journalist came by to interview us for a possible piece for NPR. I sounded like a way-too-peppy goofball I think. At some point Pizza arrived from another of the events sponsors. It was deep-dish Chicago style and it was amazing and filing. Throughout the evening we had energy drinks from the events national sponsor Bawls energy drinks. The G33K B33R, an energy drink Root Beer was pretty good, but the regular drink was not so hot. Comic Outpost also had a bucket of cold drinks the whole event and lots of snacks for us too. – By 7pm I had worked to page 15. Through out the event the store was open to customer who came in to see what we where doing and the store had a sale on 50% off Trade Paperbacks from 2am to 6pm. There were periods when chatting and laughing got sort of over the top, but later the time got…the quieter it would get. – By approx. 10 PM I had finished my rough pencils (an hour before the half way point) and then spent time to design the characters. I brought way too much reference material. Character Designs with a Black Paper page on the right. – By 11 PM I was inking the first pages, nervous with each stroke that I was going to ruin all the work and planning I had done. The nice think of having the pages penciled first is that you can just be more focused in your art and not have to make decisions when you have a lack of sleep. For some elements that seemed intimidating I waited till I had warmed up and came back to them. I would sometimes jump to a page that excited me when I got frustrated. By midnight sleep was creeping in from intense work and over eating of starchy treats. We had the provided energy drinks and coffee brewing, and some folks went to the nearby 7-11 to get some Red Bull and Sparks (malt liquor energy drink)! – For inking on the black paper I used both a white gel pen as well as some white FW acrylic ink. The white ink on black is amazing looking and really fun to do. It’s great way to get a different look. Next year I would like to try some parchment looking paper too. As the early morning progressed folks go tense and tired, but we pushed on. Some people begin announcing each milestone as we got closer to our deadline….11 am. At about 10:30 am the radio reporter came back to record a recap of our experience with the event. Artist Miromi had all ready finished and had left, but the rest of rushed to the finish line. As 11 AM on Sunday October 19th arrived we stopped our work and took a look at what had been done. All in all 11 folks participated with 8 of the artist finishing a complete comic. But it is safe to say that everyone was proud of making it through the 24 hours and somehow surviving. – addition: I felt as I got to the end of my inking at around 10 am that part of the story was not working and that another page was needed. I also did a cover illustration. – I personally did not officially finish my comic since the goal is to complete the work and I did not get to the word balloons in the allotted time. I think I did pretty good work considering I lost about 3.5 hours to go teach. I will happily do it again next year if my schedule permits me too. I will be positing my comic on-line soon and I will also be posting links to other artists work as well. I hope that some of you will participate next year. I did pretty good job considering that I had less then 24 hours to draw my comic, which ended up being 26 pages of art. – I need to come up with a way to do the word balloons, though if I had the additional 3.5 hours that I missed I could have easily scanned in the art and added them in Adobe Illustrator or Photoshop. Another option would be to use white sticky notes to put them in place, but that might take a lot more work. – I brought too much reference than needed. Part of the challenge is to see what you can do when “the going gets tough.” I found that it’s better to just spend a few days before the event sketching and practicing drawing your theme of choice. – I was glad to have an idea of what subject matter(s) I wanted to draw ahead of time. – I brought too many tools that I did not need. If you have given yourself a trial run/practice you can figure what you do or don’t need. I for instance, I very seldom used an eraser. – Use a template or pre-ruled paper to save time. Anything you can do ahead to prepare is good. I ruled blue outside boxes on mine the day before. You can download my template HERE. – Draw small so that it takes less time. Working at 100% of a printed comic works well. – Some planning of story at the start of the challenge is good, but not so much that you can’t change it when it flows a different direction. – The fewer characters in a story the better. – Pace yourself and know what you need to get done by a certain time. – It’s OK to use reference as long as it does not slow you down or become a crutch. – While planning your comic out ahead of time is not a good idea, having a gernÃ© or theme does not hurt. It will allow you to jump in and find your story faster. – Set deadlines to meet through out the evening. I.E. if you are going to pencil all your work first, then ink it you might need to get your first phase done by the half way point. – Bring a desk lamp for better light. This made the whole challenge a lot better. – By penciling first through the whole story, it makes it easier to get it done then when you are tired and not as mentally aware (like at 4am). This might not work for everyone, but it worked for me. – Know how the story will end and even draw the last page so you can work towards it. Of course you can do a story that ends on a cliff hanger as well. – You don’t have to do any step of the project in order. For instance drawing pages out of order. – Bring healthy snacks. Carrot sticks are great. – If you are done before the deadline, you might want to stay till the end to enjoy the rush of everyone finishing. It also gives a chance for folks to exchange information to stay in touch. – Working with others makes it a lot more fun and easier to keep going when things are rough. – It’s better to practice ahead of time things you might want to draw vs. bringing artbooks and lots of reference. I was most proud of what I could do right from my own imagination. To see more photos from the event, visit my Flickr set.